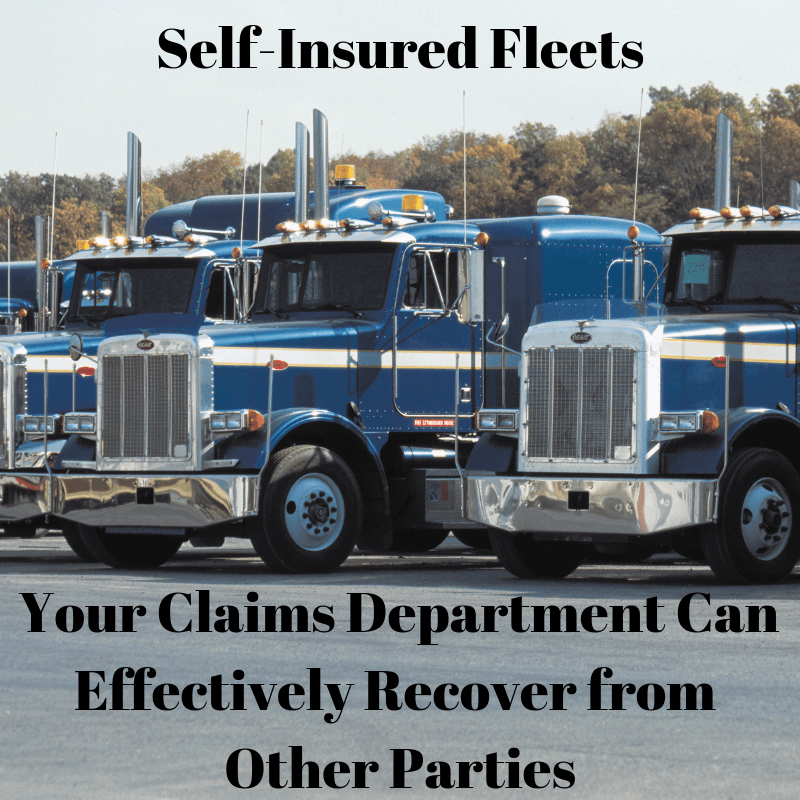 Self-Insured Fleets: Your Claims Department Can Effectively Recover from Other Parties | Eckert & Associates, P.A. Is your fleet considering becoming self-insured? If already self-insured, is your claims department successfully recovering from at-fault parties? Many trucking fleets become self-insured to lower insurance costs. The self-insured retention (amount of loss the company covers directly) plays an important part of a fleet’s risk management plan. However, not every fleet handling their own subrogation does so effectively. A self-insured retention can drastically lower a fleet’s insurance premiums. The claims department can decide whether to settle a claim or take it to court. A fleet has incentive to control losses since it’s paying them out of pocket. Cash flow may improve; losses are paid as they occur rather than paying for them in advance via insurance premiums. Lost money is found in subrogation recovery. Unfortunately, many fleets overlook collecting money from the bad drivers who damaged the fleet’s equipment. Sometimes pursuit gets lost in the shuffle of the claims handling process; with emphasis instead on negotiating repair costs, “covering” losses, seeking immediate medical attention, and the like. Consider what happens after a claim has been paid. Is the claim file closed without pursuit of the at-fault driver? Are staff assigned to pursue collection? Is recovery put on the back burner because the only emphasis is on future safety and better driving habits? Safety education and training remain important to maintaining low claims costs, but it won’t always stop bad drivers from damaging your equipment. When damages do happen, claims should be pursued. Some fleets request their insurer to handle subrogation recovery for them. If this is a consideration, determine whether the insurer has a strong incentive to recover losses. If the insurer didn’t pay out on the losses, they may not have a desire to pursue the claims aggressively. Leverage the staff of a subrogation law firm to your fleet’s benefit. By using outside assistance, it is possible to increase claims recovery without adding in-house staff. A law firm being paid on a contingency fee basis has a great incentive to recover as much as possible for the client. Law firms that know transportation and trucking further leverage a fleet’s time and resources. The retention of experienced and competent counsel deters negligent third parties from escaping liability by using nuances or attempting to inaccurately utilize case law. The law office of Eckert & Associates, P.A. focuses on truckers and fleets. We collect claims nationwide. Working on a contingency fee basis, we’re motivated to recover the most money possible for our clients. Contact us today at 904-278-7688 to see how we can help your fleet’s bottom line.